October 25, 2018 | By Fatima V.
On National Coffee Day many generous Love’s patrons donated without even taking free coffee! 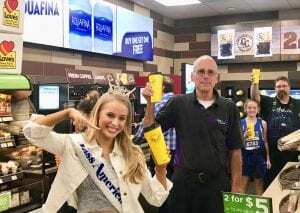 Miss America’s Outstanding Teen visited Love’s Travel Stop locations in Van, Texas. Thank you Love’s for your support! Next post: Save the Date for DFW Business Council Golf Tournament!